A great gift for the coffee lover in your life. Simply choose the coffee, grind size and frequency and that’s it. We will send your coffee lover their coffee, freshly roasted for them to enjoy. The first order is sent with a Two Chimps Coffee Tin and Magnet set for storing coffee, a letter and the first bag of coffee. 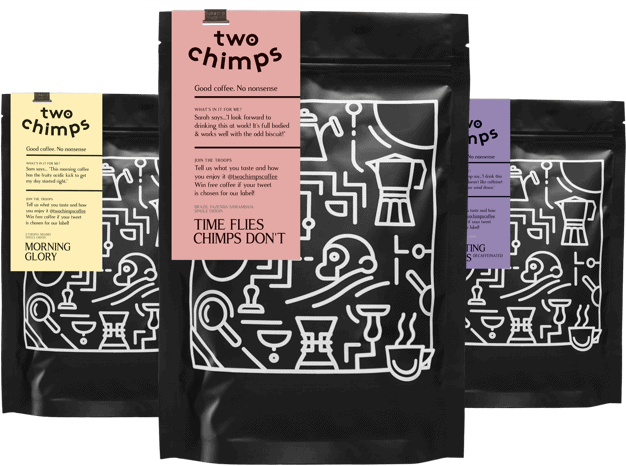 Orders after this will be sent with free first class postage; 250g coffee bags are letterbox friendly and 500g bags are delivered in a small parcel. Hand roasted in small batches; we send only the freshest coffee every time. Our single origin coffees are ethically sourced from smaller farms all over the world. Using small farms means that our coffees do change from time to time, but when they do, we will choose a coffee from another origin with similar flavours to replace its predecessor. If it’s not quite to the same liking, you can let us know and we’ll do a swap. Just choose the desired roast style and grind size and we will do the rest. If you would like a selection of all of our coffees, including our ever-changing limited edition blend, select the Mystery Coffee Gift Subscription. Your coffee lover will receive a randomly picked bag of coffee each time – what an awesome way to try lots of different coffees. Are you ahead of the game? If you would like to order but delay the posting date, you can! Just pop a note on the checkout page and we will follow this and post when required. At least you can tick it off your list. So go on, choose your coffee gift subscription and become a gift-giving wizard!